The object is logically known as a "transient feature" but astrophysicists have bouncily called it the "magic island". This might be the first time lively geological procedures have been detected in Titan's northern hemisphere. The study is published in Nature Geoscience. Jason Hofgartner, from Cornell University in the US and the chief author of the paper, said in a press release "This discovery tells us that the liquids in Titan's northern hemisphere are not simply stagnant and unchanging, but rather that changes do occur," The scientists are now learning about the "magic island" further. Titan is the main of Saturn's 62 known moons and is shielded in lakes and seas. Underneath its thick atmosphere, which is deadly to humans, it thoroughly look like a smaller, watery Earth, with wind and rain generating familiar lands such as mountains, hills and lakes. It's the only place other than Earth known to have stable liquids on its surface and falling rain. But as an alternative of water, icy cold liquid methane and ethane streams over its river-like networks and into its seas and its dunes are made of hydrocarbon. The second major of these seas is the 150-metre-deep Ligeia Mare, where astrophysicists observed the unfamiliar geological feature in a photo taken by the Cassini spacecraft on 10 July 2013. The island seemed around 9.6 km off the sea's southern shore. Images taken of the same spot before and a few days later displayed no geological features there. 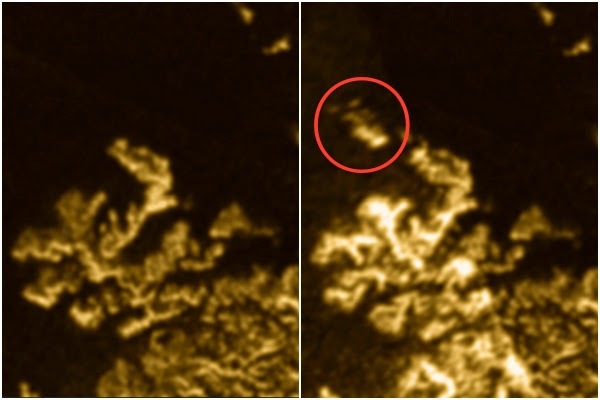 Titan's northern hemisphere is presently transitioning from spring to summer, seasons which last much more lengthier on the moon than on Earth, and the researchers consider this change could have generated this mysterious island to appear momentarily. Hofgartner said "Likely, several different processes – such as wind, rain and tides – might affect the methane and ethane lakes on Titan. We want to see the similarities and differences from geological processes that occur here on Earth. Ultimately, it will help us to understand better our own liquid environments here on the Earth." - Northern hemisphere winds might be kicking up and creating waves on Ligeia Mare, which the radar might have grasped as a kind of "ghost island". - Gases may have climbed from the sea floor to the surface, generating the "island". - Frozen solids from winter might be growing due to warming temperature. - Ligeia Mare does not have suspended solids, which are dipped nor moving, but look like silt in a terrestrial delta.